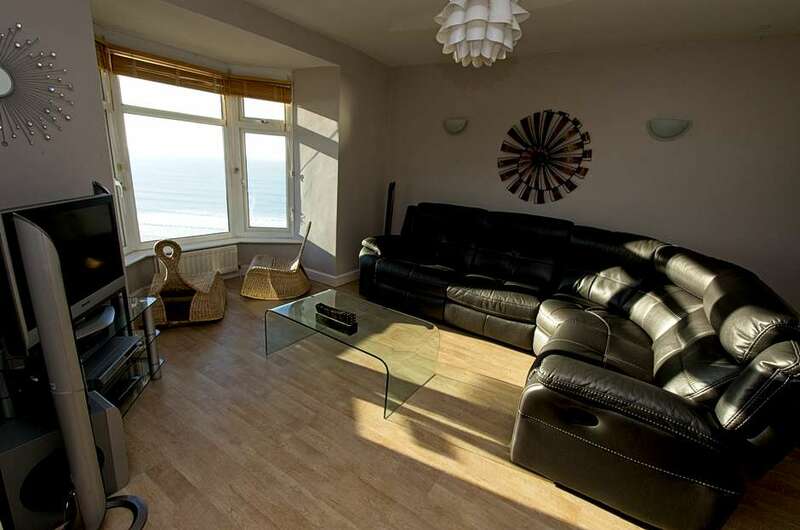 This fabulous seafront maisonette sleeps 6 in 3 bedrooms and has one of the most outstanding views in Woolacombe. Its south facing glass and stainless steel fronted balcony is the ideal place to sit and watch surfers, spot dolphins and sea birds or just relax and enjoy the sun trap reading a book – simply perfect!! As part of the Sunnycliffe Court development it is situated over Overcombe, the 2 bedroom apartment below and next door to Cliff House also featured on our website. For a large family group why not book 2 or even 3 of these super holiday homes together? Sealoft has the enviable position of being just across the road from the coast path which winds its way around to Grunta Beach, Morte Point and beyond. In the opposite direction it is just paces to the grassy area above Combesgate Beach, a National Trust beach and a favourite with local surfers. A few minutes more is Barricane Beach famous for tiny shells brought in on the Gulf Stream and its lovely seasonal beach café with real mugs of tea, huge slices of amazing cake and the well renowned Sri Lankan curries. On a bit further and you reach the fine 3 mile stretch of sandy beach known as “main beach”. However, if you prefer the seclusion of the more discerning area around Combesgate Beach, lovingly termed “little Switzerland” due to its picturesque setting on the pretty cliffs and green valley, then Sealoft is a great choice. Ample parking for 2 or even 3 cars and offering 3 bedrooms, living/dining room, kitchen, utility and plenty of bathrooms (4 loos! ), this is such a super place to enjoy a family holiday all year round. The entrance lobby has a door to a newly built shower/room wet room, designed for returning from the beach. It has a shower, wet suit hooks, basin and WC. Then upstairs on the living level is a cloakroom WC, utility room housing Miele washer/dryer and double sink, kitchen, master bedroom with dressing room and en suite and living/dining room with door to balcony. The compact kitchen has 1.5 bowl sink, built in single electric oven, gas hob, 50/50 fridge freezer, full size dishwasher and small breakfast bar to seat up to 2 to 3 (at a push) with fridge under and small TV. The modern living room has door to balcony, L shaped sofa, TV, DVD, Surround sound, coffee table, dining table extending to seat 6 and the most unforgettable view from the bay window where 2 little rocker seats offer the perfect place to sit for hours! On this level is the master bedroom suite consisting of good size bedroom with super king bed, stunning views to the front over the entire bay, dressing room with huge wardrobes and a good en suite with double shower tray, WC and wash basin. Upstairs are 2 further bedrooms and their own shared bathroom with bath, separate shower, WC and wash basin. The twin room has Velux windows, 2 x 3 ft single beds and chest of drawers. The sloped ceilings limit height but are fine for children. There is a 19” TV in here. The other slightly larger bedroom has a great view to the front over the bay, a king-size bed, small built in wardrobe and double chest of drawers. The sloped ceilings are better in this room so it is fine for adults or older children. This room has a 32” TV. Sealoft makes an ideal holiday home for an extended family. Convenient for both Woolacombe and Mortehoe, it is the perfect choice to enjoy North Devon at its best. Saturday changeover.